La regina del fango infatti ha 5 stelle!! This is the mother of all street legal mud tires. If you're looking for a good mud tire, this is the one everyone talks about. Its huge lugs resemble the paddles of a riverboat and perform in much the same way propelling the vehicle forward through the mud. The three stage lugs and deep voids in the aggressive tread design extends down onto the sidewalls to add just that much more bite in the deeper mud. With 6, 8 or 10 plys in the ply rating (model dependant) this tire has a strong, puncture resistant, tear resistant sidewall, however tends be on the stiff side until well broken in. 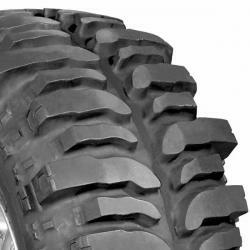 The Bogger is the preferred tire for many rock crawlers who say the Bogger performs very well on the rock. Its seriously aggressive tread also allows it to perform well in snow and sand as well as the changing conditions of the wooded trails. One drawback to its tread design is the fact that it may not grip as well when lateral traction is needed as when the vehicle may be traveling sideways along a hill rather than up or down it. In this case the tread may act more as skis allowing the vehicle to slip sideways and the lack of sipes doesn't help either. Interco Tire Corporation attempts to give this tire some street friendly attitude with minor success by breaking up the lug pattern to avoid a harmonic vibration but regardless the ride is quite rough, uneven and loud on paved road. Needless to say this tire is not one you want to commute to work every day with as it produces plenty of street noise and does not handle very well on pavement. However is is street legal, D.O.T. approved and actually does wear quite well, probably due to its harder compound. For the weekend warrior, this is a great second set of tires for the weekend offroad event to be replaced by a set of all terrains for the Monday morning commute. Some offroaders prefer to mount a set of Boggers on the rear with a set of Super Swamper TSL SSRs on the front for a great combo. Available sizes range from the 30.9" up to the 44.1" in tread widths from 9.8" to 15.4" in various combinations. Available rim sizes in 15", 16" and a 17x10 model. pro kennex super spin chi la conosce?